Harbor Point is approximately 140 acres of land located between Utica Barge Canal Harbor and the Mohawk River. The area was developed for industrial purposes in the mid 1800’s and has been the site of two manufactured gas plants (MGPs), a coal-fired steam plant, a petroleum storage and distribution facility (Mohawk Valley Oil) and a tar products plant (New York Tar Emulsions Products (NYTEP)). In the 1920s, the Harbor Point peninsula was the location of the largest energy-producing complex in North America. The New York State Canal Corporation is the primary user of Utica Harbor, which defines the eastern side of the Harbor Point peninsula. The Canal Corporation operates a canal maintenance facility on the southern and eastern sides of the harbor on property which is owned by New York State. On the other side of the Mohawk River, to the north and west of the peninsula are the Utica Marsh and three former dredged sediment disposal areas. National Grid will provide activity updates for neighbors of the Harbor Point former MGP site. The update will describe the work that has been done to implement the Remedial Action Plan, and provide an outlook for upcoming work, including information about any work that may impact normal community activities. The Report Archive section under the Key Documents tab of this website will include all of the Updates. A large-scale soil removal project (within the central portion of the site) and a smaller scale soil removal project (along the banks of the Mohawk River and Canal) were completed this year to advance the environmental cleanup of the NM (Niagara Mohawk) Harbor Point environmental cleanup project. 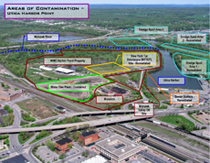 The cleanup activities were performed by National Grid with oversight provided by the New York State Department of Environmental Conservation (NYSDEC) through New York’s State Superfund Program. PAH Soil Removal Project: This project involved the stabilization, excavation, and off-site disposal of 126,000 tons of soil at an approved facility. This project was conducted in compliance with a NYSDEC-approved remedial design. Excavated areas were subsequently backfilled with clean backfill material and the area restored to pre-remediation condition, including wetland and other habitat restoration. Peninsula Excavation and Restoration Project: This project involved soil excavation and off-site disposal of 14,000 tons of soil at an approved facility. This project was conducted in compliance with a NYSDEC-approved remedial design. Excavated areas were subsequently backfilled with clean backfill material and the area restored to pre-remediation condition, including habitat restoration and placement of trees along the Mohawk River and Canal banks. Future work is planned at the location of the former Coal Gas Plant near the Canal Harbor as well as work within the Mohawk River. The Monarch Chemical Site is being cleaned-up separately from the National Grid and NYS Canal Corporation project. Jones Chemicals Inc. installed groundwater extraction wells at the site in 2009 and completed the installation of a treatment system in 2010. Contaminated groundwater collected by the wells is pumped through the treatment system, which is monitored by the NYSDEC. The groundwater collection and treatment is an on-going operation. Harbor Point comprises approximately 140 acres of land located between the Utica Harbor and the Mohawk River. The area was developed for industrial purposes in the mid-1800s and was the site of two manufactured gas plants (MGPs), a coal-fired steam plant, a petroleum storage and distribution facility (MVO) and a tar products plant (New York Tar Emulsion Products). Currently, a gas regulator station and electric substation occupy Harbor Point, along with active maintenance and office facilities for the NYS Canal Corporation. The remainder of the Harbor Point Site is undeveloped land. 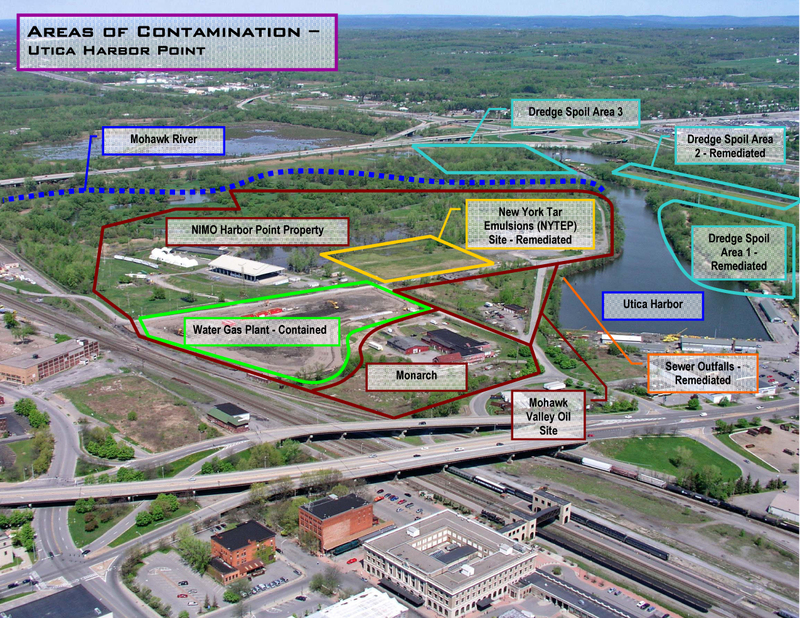 Coal tar, a byproduct of manufacturing gas, was released to the environment resulting in the contamination of soil and groundwater at the Harbor Point Site and the contamination of sediment within the Utica Harbor. Despite the presence of these contaminants, people are not currently exposed to contamination at the site since access to the site is restricted and groundwater in the area is not used for drinking water. Through a combination of clean-up actions, land use restrictions, and long-term management to prevent the potential for future exposures, the Harbor Point Site and surrounding sites may be redeveloped and used in the future in a protective manner. Cleanup of environmental impacts on the peninsula and the adjacent Utica Harbor and Mohawk River are being undertaken primarily by National Grid. The New York Tar Emulsion Products Site has been remediated by Beazer East, Inc and Suit-Kote Corporation. National Grid and the NYS Canal Corporation have an agreement for the remediation of Utica Harbor and certain adjacent dredged sediment disposal areas. The remediation of all of these sites is overseen by the NYSDEC, in consultation with the New York State Department of Health. The clean-up activities will continue to be performed according to established health and safety regulations and guidelines. Safeguards will be in place to protect construction workers and the community during clean-up activities, including measures to monitor and control air emissions. Adjacent to the Harbor Point property is the former Monarch Chemical property which is being addressed by another party under a separate cleanup order. Currently, a gas regulator station, electric substation and National Grid’s remediation research facilities occupy Harbor Point. The remainder of the Harbor Point Site is largely undeveloped land. The nearest residential area is a multi-family public housing complex located across the railroad tracks, about 500 feet beyond the southern-most site boundary.